It's a little late to be an "E3 2015" trailer, but we'll let InXile off, as this is the first footage of their upcoming Wasteland 2: Director's Cut. Announced last month, the Director's Cut will update the game to Unity 5, thus bringing better environment textures, character models and lighting. Outside of the engine, the new version will also feature thousands of lines of new dialogue, extra character customisation and reworked combat. 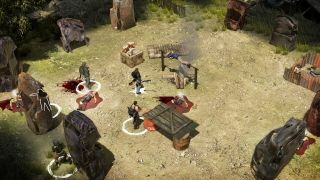 It all sounds like a pretty big overhaul, and, even better, it will be free for all owners of Wasteland 2. The Director's Cut is due out in late Summer.